What should you - a journalist – do when you want to interview the mother of a teenage murderer for an in-depth report of a crime story? This would make a fascinating report; however, it could also hurt the mother who has been suffering the pains of her son’s crime. Working as a TV reporter for seven years, I always faced such questions whenever I made investigative reports. occupation of Freedom Plaza, unfurl banners Tuesday in front of the Capitol. On Tuesday this week, Republicans in the US Senate blocked President Obama’s jobs bill despite his campaigning efforts across the country. According to the BBC, Democrats said that Republicans are more interested in defeating Obama than helping the country recover from its deepest recession since the 1930s. 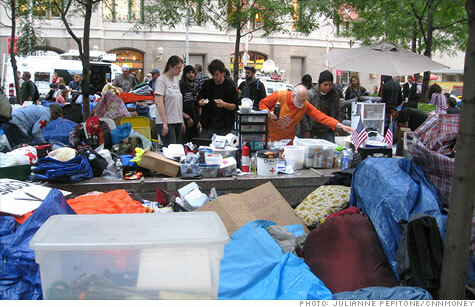 It is very interesting to watch footage of the recent ‘Occupy Wall Street’ movement on CNN website. I have rarely witnessed such peacefulness in a leaderless movement. It is now probably time for us to see a model of ‘anarchy’. (VOV) - Many legal and political experts believe strict law and punishment are unable to prevent an increase in crime across the world. Now the Arab Spring protests, sweeping through Africa and the Middle East this year, have inspired the US. As CNN reports, it is the 3rd week of the Wall Street protest expressing people’s anger with the U.S. economy and corporate greed; and the movement has gained momentum nationwide through online social networks, such as Twitter and Facebook.